ERGONOMIC SIT-STAND WORKSTATION. It's recommended that you switch from sitting to standing a few times per hour to prevent getting body aches and pains, diabetes, obesity, heart diseases which sitting for extended periods can cause. 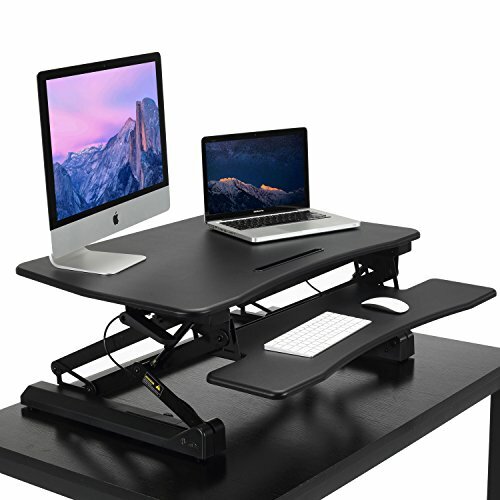 HANKEY Sit Stand Desk is an innovative standing desk, designed to create an easy transition from sitting to standing. TWO-TIER DESIGN. With ample shelf space, the two-tiered system puts your monitor at the proper viewing height and the keyboard and mouse at the proper working height. The top shelf is well spacious to securely accommodate monitors, a laptop or extra work accessories and the desk can hold up to 35 lbs. BUILT-IN PNEUMATIC SPRING MECHANISM. HANKEY Office Desk Stand features a gas spring hovering system which moves the desk quickly and quietly from standing height to sitting height and back again with just a light squeeze of the handles. WIDE RANGE OF ADJUSTMENT. In order to accommodate as many different sizes of people as possible, this ergonomic standing desk offers you 12 height levels to choose from. It's very sturdy and you won't experience any wobble even when the desk is at its maximum height. 100% SATISFACTION GURANTEED. Our desk comes in 2 different colors (Black and White), so you can match it to your current office decor. Also, we relax to offer a 5 YEAR COMPREHENSIVE WARRANTY, so invest your money risk free on our stand up desk. If you have any questions about this product by HANKEY, contact us by completing and submitting the form below. If you are looking for a specif part number, please include it with your message.